Revocable v. Irrevocable Trusts in Florida | DeLoach, Hofstra & Cavonis, P.A. Many people have questions and general confusion about using inter vivos trusts in their estate plans. There are two basic types of living trusts, revocable and irrevocable, which are both used for different purposes. Here, I will discuss where you would use these types of trusts and some of the key differences between them. There are many different types of trusts, all with different names and purposes. When a trust is created and used immediately, this type of trust is generally referred to as a "living trust." Living trusts are sometimes referred to as an "inter vivos," which is latin for "among the living." Most living trusts created are "revocable living trusts," meaning the settlor (the trust's creator) can make changes to the trust during their lifetime. Most revocable living trusts are created by folks while they are living in order to provide a means to avoid probate and manage assets in the event of disability. A revocable living trust is like a last will and testament in many ways - just like a will, a revocable living trust can be revoked or amended at any time by trust's creator(s). Other parts of our website have more on Florida revocable living trusts. When creating an estate plan, we normally look at either starting with a "will based" or a "trust based" estate plan. With a "will based" estate plan, you may plan to have some or all of your assets distributed according to the Florida probate process. The purpose of a revocable living trust is primarily to plan to avoid probate and also prepare for your disability. The key to a revocable living trust is that you control the trust's assets during your lifetime, which retains a great deal of flexibility in how it is run. Put simply, it is your asset while you are living, but when you die, the assets in the trust avoid probate. Revocable living trusts are fairly simple because there is no need for a separate taxpayer ID number (i.e., an EIN) and no need to register or file the trust anywhere during your lifetime. This type of trust acts as a holding container for assets and passes title to the assets to the trust beneficiaries upon your death. A revocable living trust may also include important provisions to protect the settlor(s) or other beneficiaries in the event of disability. A revocable living trust does not become irrevocable until your death(s). Upon the death of the settlor(s), the revocable living trust transforms into an irrevocable trust, whereby the trust remainder beneficiaries receive their assets as you direct. Importantly, a revocable living trust is NOT a way to protect your assets from the high cost of nursing home care. If you want to protect your assets from the nursing home, you may want to look at an irrevocable trust. Each of these trusts have a specific purpose, which frequently revolve around asset protection from the nursing home, for instance. As elder law attorneys, we frequently use irrevocable trusts in a variety of circumstances. D(4)(a) Trusts: Used when a disabled person under age 65, usually one who receives SSI/Medicaid, receives an inheritance or money judgment from an accident. Qualified Income Trusts: used when an elder is needs long-term care Medicaid and his or her income exceeds the income cap. Pooled Trusts: Used when an elder/disabled person needs to protect assets for his or her benefit while receiving Medicaid. Usually, smaller sums are money are place into pooled trusts. Irrevocable Asset Protection Trusts: Used to protect your assets from the high costs of long-term care. We have a good bit about these trusts on this webpage. You can even use these types of trusts to protect your home from the nursing home, for instance. We also offer a free guide to irrevocable asset protection trusts if you are interested in protecting your assets from the nursing home. Irrevocable Life Insurance Trusts: Used to help eliminate or reduce estate taxes through owning life insurance. When deciding to create your estate plan, most plans start with the base of revocable living trusts, and may use irrevocable trusts in a variety of ways. An estate plan that uses irrevocable trusts usually starts with the concept of asset protection for your children or other heirs, which also means that you are comfortable giving away control of a substantial portion of your assets during your lifetime. While trust planning may be a great way to start your estate plan, please remember that you are likely be incapacitated before your death, which may include dementia, stroke or other debilitating disease. In this event, make sure you have your incapacity planning done as well. We look forward to working with you on looking at your goals, your assets, and how living trusts, both revocable and irrevocable, fit in to the right estate plan for you. 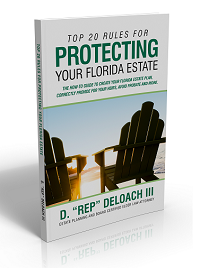 If you are looking to create your estate plan, you should definitely read a copy of my book, the Top 20 Rules for Protecting Your Florida Estate.